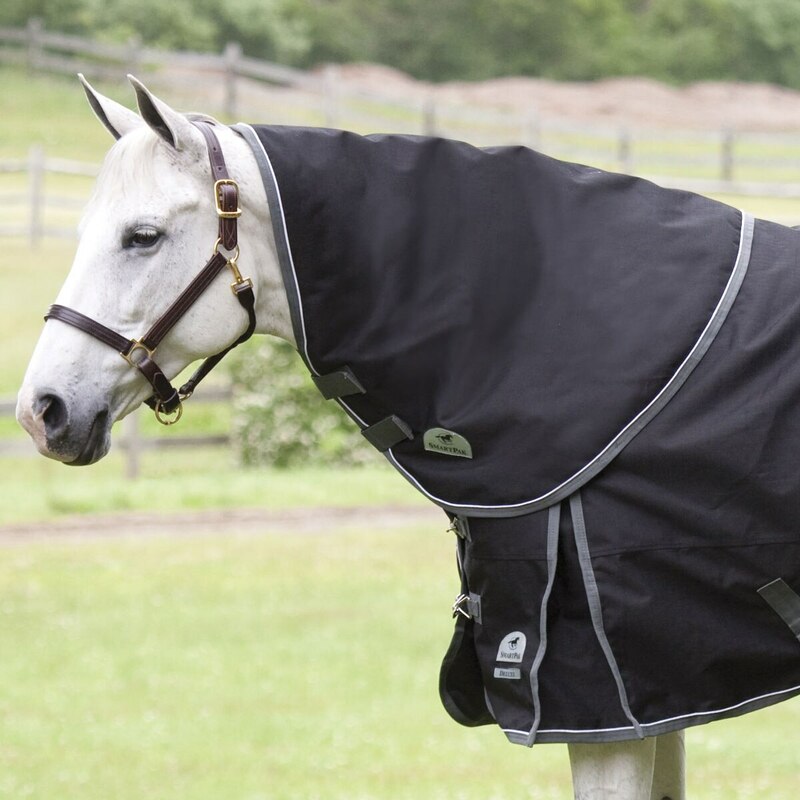 Give your horse additional protection for his neck with the SmartPak Deluxe Neck Rug. The 1200D ripstop polyester outer is just as tough as the rest of the SmartPak Deluxe Turnout line and the silky nylon lining will help prevent unsightly and uncomfortable rubbing. Sturdy snap attachments and two additional hook and loop closures let you easily and securely attach the rug to your turnout. Available in Light (0 g) and Medium (220 g). Lost in a blizzard of blankets? Click here to find the perfect SmartPak Turnout! Special Features Waterproof and breathable. SmartPak Deluxe Neck Rug is rated 4.2 out of 5 by 78. Rated 1 out of 5 by Shopper from Unacceptable design I’ve finally given up on this neck rug. I’ve tried everything to make it work. I’ve added elastic to the Velcro closures to give my horse more room to lower his head and reach for grass. Nothing works. The straps have torn off so many times I can’t even count. I ordered the largest size and it still doesn’t fit right. The worst part is I have the matching heavyweight blanket and now I have no neck rug to use with it. What good is a 10 year warranty if the basic design is poor. Bad investment. Rated 4 out of 5 by Parider89 from Nice neck rug, could use some improvements I bought this neck rug several years ago to match my Deluxe turnout blanket. The quality of the actual rug is pretty nice—it’s stayed waterproof for several years, my horse hasn’t ripped the actual material yet, and it fits him well (he’s a 78”, large neck rug is the perfect size.) The downsides are the attachments and Velcro closure. The attachments are flimsy and cheap, easily ripped or broken. For a $70+ neck rug that is not acceptable. The Velcro closures are also lacking. It’s just two Velcro straps that attach, no hook/loop closure like a Horseware blanket. This makes it very easy for friends to remove each other’s hoods, and once they start doing that and the Velcro gets dirty, they take the whole neck rug off almost daily. I’ve has the same issue with the hardware on the actual blanket itself. Within the first few days of wearing it, one of the chest snaps broke in half. Like the solid metal lobster claw broke into two pieces. It was an easy fix with a double ended snap from the hardware store, but for the price of the Deluxe blanket this should not be happening. Otherwise it’s pretty nice. It doesn’t rub my horse (high withered OTTB) and the waterproofing has held up great. He has a few small tears in it, but the blanket is four years old and he plays hard. If you have an older or not playful horse, or maybe a horse who gets solo turnout, this is a nice option. Wait for a sale—this isn’t worth $70. Rated 4 out of 5 by Joseph from neck rug It is a good product but does not match my deluxe blanket. had to Jerry rig it to make it work, but it suits its purpose. Rated 5 out of 5 by Akerney from Great Fit! I got this for my horse since he did not have a hood. Nice weight and durable! keeps the rain out so he is nice and dry. I like that the hood has one clip so the hood stays on in case the two Velcro straps come undone. Rated 5 out of 5 by Tami from Really nice blanket and neck rug! I have purchased other brands before but these seem really well made. We shall see how long they last. I ordered a medium weight and a med/light weight with the corresponding neck rugs and my boys are toasty warm and dry in the wet Western Washington climate. I have one horse with a thicker coat than the other, hence the different weights. Even when the temp gets a little warm and consider taking off their blankets and change out to a sheet, they stay dry and don't sweat under these so I haven't had to do the temporary change out from day to night. I would recommend these if you are looking for new turnout blankets. Rated 2 out of 5 by Parie from Questionable Quality When I originially bought this neck rug, it only lasted a week before the snap attachments broke off. Customer service was great and exchanged the neck rug for me. I got a new one in a week... and not even two days of wear later, you guessed it, there is no way for me to attach the neck rug to the blanket. I would really like to see SmartPak figure out how to create a better attachment to the blanket. I was slightly upset that it broke again. The actual rug quality is ok, I'd say, but the attachments are the real issue! I would just spend the extra money and try to get the Ultimate (that has the 10 year warrenty)! Rated 2 out of 5 by Mldhorse14 from Poor attachment Matches the turnout in quality and durability but the attachments to the blanket were not thought out and often flap up. I've tied the elastic to make them tighter but nothing works. Rated 5 out of 5 by GEVA from Excellent Hood I bought this to go with my SmartPak Deluxe turn out and it works great! Is easy to attach to the blanket and also will attach to other blankets that aren't SP. I like that it has velcor closures on the neck as opposed to buckles - much easier to manage when it's cold out and your hands are in gloves. Rated 5 out of 5 by maggie727 from Excellent neck rug I bought this but my old blanket didn't have the clips to attach.. So since I needed to purchase a new blanket and neck rug I decided to send this one back and get the SmartPak Ultimate blanket and neck rug because of the warranty. And those are awesome. But this Deluxe was extremely high quality.